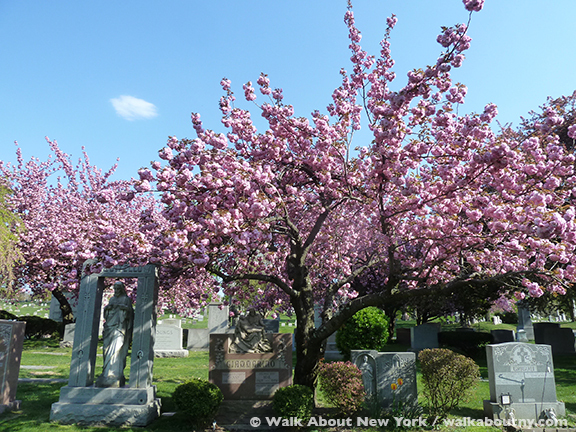 Kwanzan Cherry Trees in full bloom, Green-Wood Cemetery, Brooklyn. 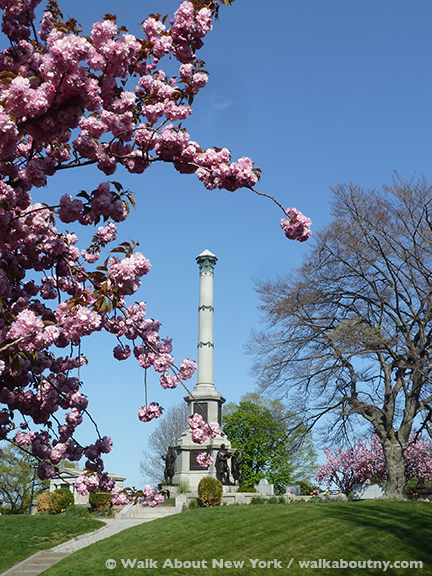 Kwanzan Cherry Trees and the Soldier’s Monument, Green-Wood Cemetery, Brooklyn. Primarily found in Japan, the Kwanzan Cherry Tree grows in the United States as well. 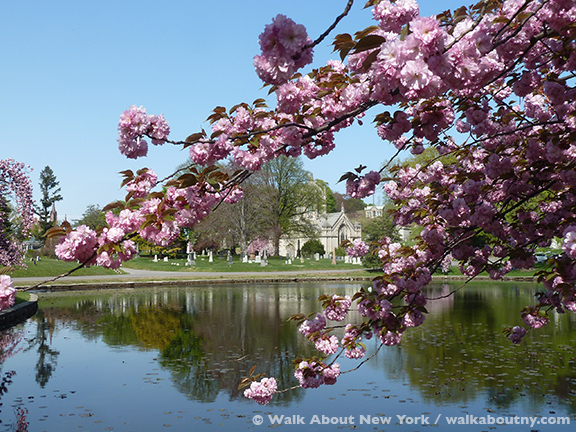 One place is Green-Wood Cemetery, a National Historic Landmark in Brooklyn. 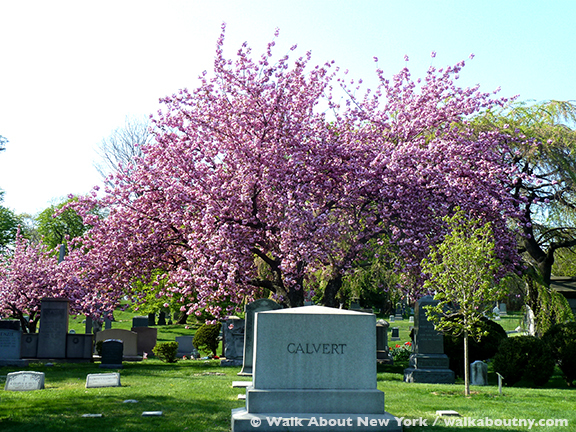 During our Gay Graves Tour at Green-Wood we were treated to the sight of its Kwanzan Cherry Trees in full bloom. 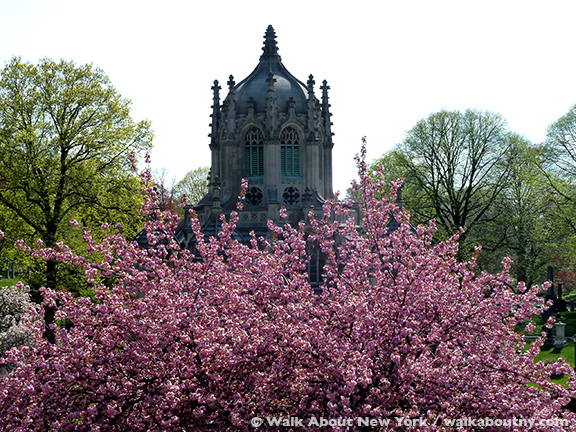 Located mostly near the 25th Street side of the grounds, the trees’ flowers aren’t just pink but “Double Pink.” This means twice as many flowers bloom than do other trees. 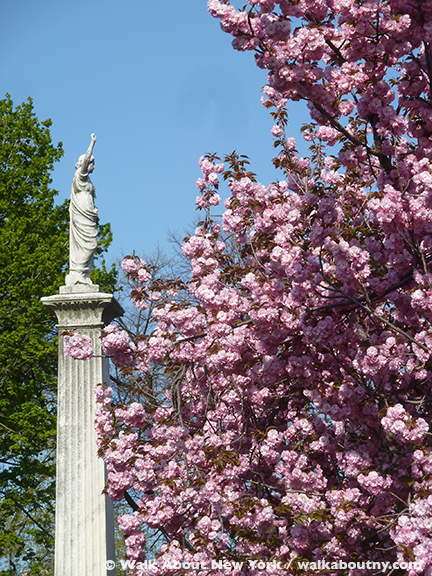 Figures pointing heavenward are frequent sights at Green-Wood Cemetery. 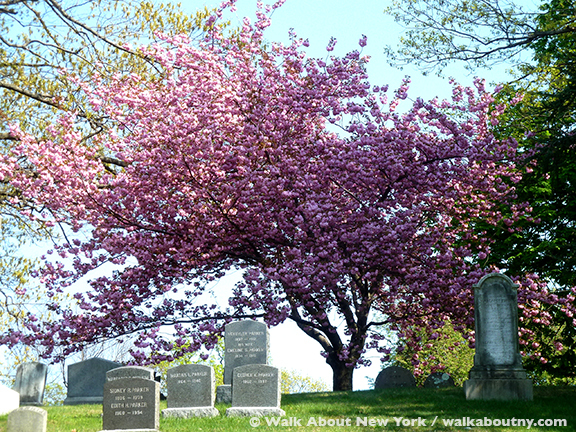 The Kwanzan Cherry Tree is one of the earliest flowering trees to bloom in April; but because of the long, harsh winter of 2015, those in New York are blooming later than usual. The large flowers appear in clusters of three to five blossoms, resembling carnations. They are the most lush of all pink flowering trees. 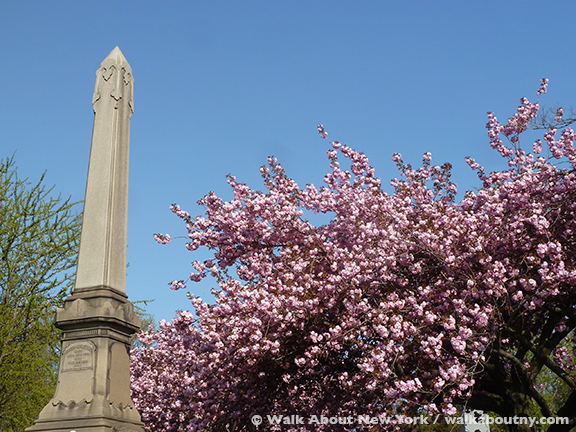 Obelisks are frequent grave markers at Green-Wood Cemetery, Brooklyn. 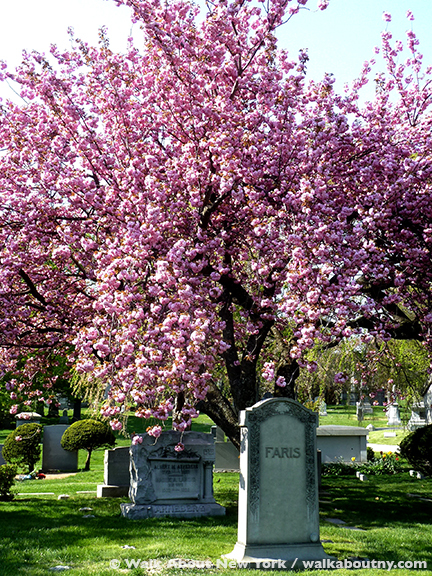 A mournful figure is seen behind branches of a Kwanzan Cherry Tree at Green-Wood. 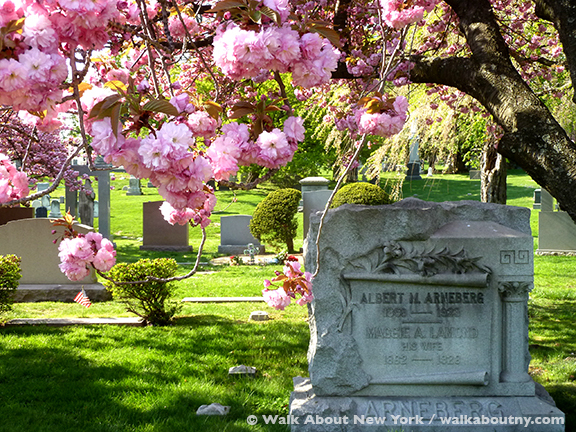 Graves in the shade of Kwanzan Cherry Trees at Green-Wood Cemetery. Kwanzan Cherry Trees are the showiest of all flowering trees. The blooming period is longer than that of other flowering cherry trees, with unusually large blooms in comparison to others. The showy blossoms of the Kwanzan Cherry Tree at Green-Wood. 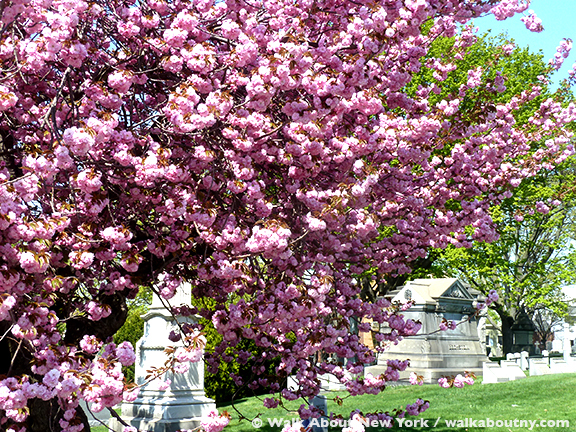 Unlike all other flowering cherry trees, Kwanzan Cherry Trees will begin to grow leaves while its flowers are still blooming. With a hint of red, its leaves are green; they turn a reddish copper color in the autumn. With a limited lifespan that is typically between 15 and 25 years, this beautiful ornamental tree will give years of beautiful blooms and fragrances, and is well worth planting. Granite makes for a more durable grave marker, Green-Wood Cemetery. Marble headstones wear away with time, Green-Wood Cemetery, Brooklyn. The Kwanzan Cherry Tree, like all other flowering cherry trees, prefers soil that is well drained, with full sun exposure to flower best. Also known as the Japanese flowering cherry tree, the Kwanzan Cherry Tree is fast growing and the hardiest of all cherry trees. Growing to a height of thirty to fifty feet, this deciduous tree will mature with a spread of fifteen to twenty feet. 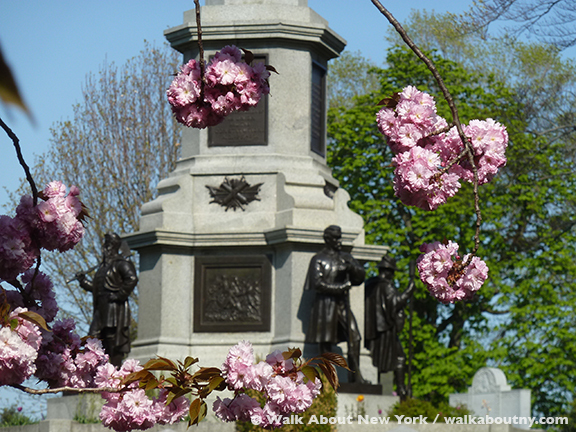 The blooms of the Kwanzan Cherry Tree will begin to fade and close up, leaving the green foliage and glossy bark. Valley Water is one of four glacial ponds at Green-Wood. The Chapel is in the distance. 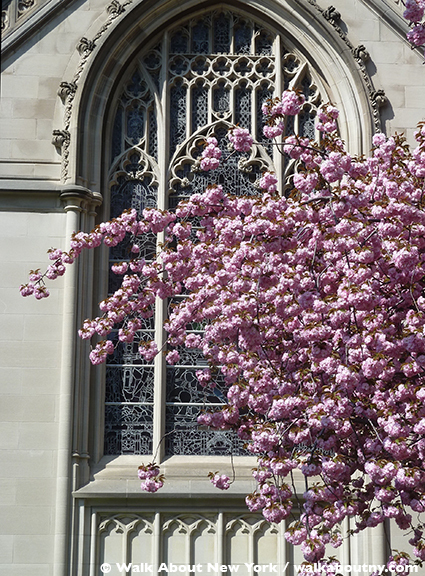 The rear stained-glass window of the Green-Wood Chapel and a Kwanzan Cherry Tree. The Green-Wood Chapel is scaled-down version of Tom Gate, Christ College, Oxford. 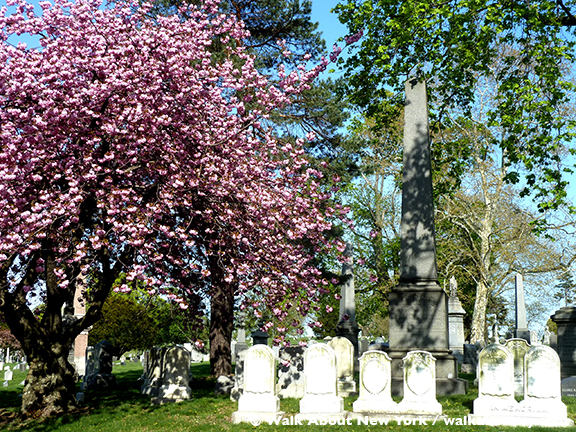 A grave stone’s image of Christ seems to embrace the Kwanzan Cherry blossoms. The Kwanzan Cherry Tree is the most popular of all the double flowering cherries; this is mostly because of its stunning pink blossoms, good color in the autumn, not bearing fruit and upright, fan-like shape. It is a splendid specimen. It can be planted in containers, along walks and streets and in median strips. The Kwanzan Cherry Tree is suitable to be used as a bonsai tree. A cluster of Kwanzan Cherry blossoms is perfectly lit. 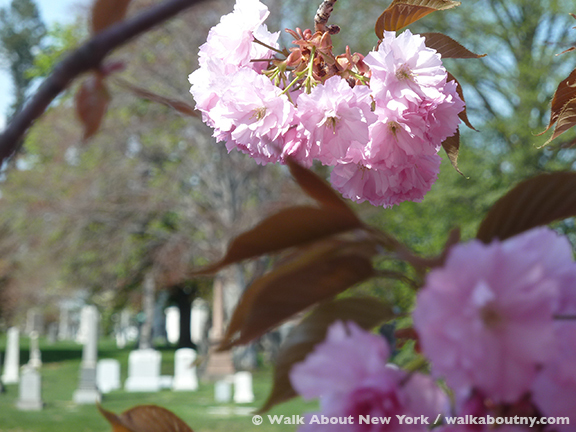 This Kwanzan Cherry Tree is lush and brilliantly pink, Green-Wood Cemetery, Brooklyn. 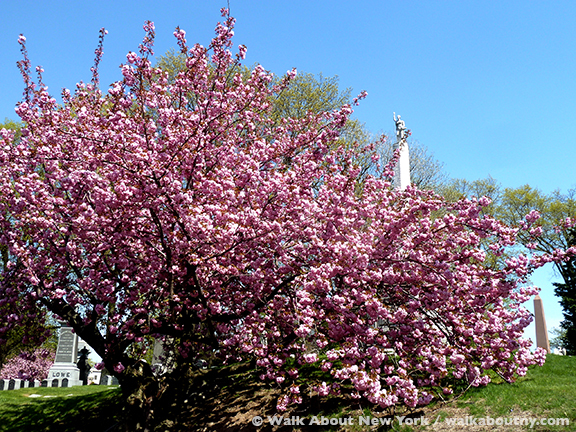 A Kwanzan Cherry Tree stands on one of Green-Wood’s many hills. 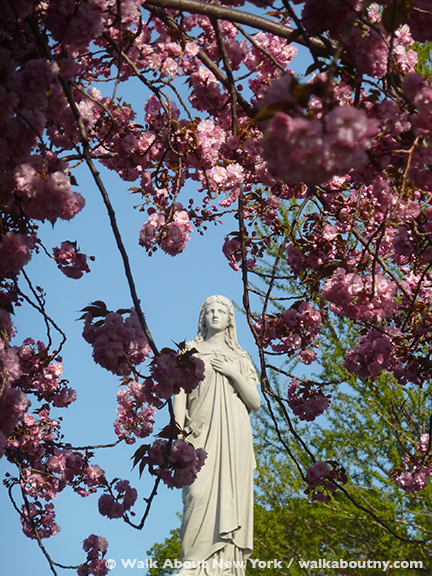 Click on the photo to see the 2014 Kwanzan Cherry Tree blossoms at Green-Wood.